On a sunny April afternoon in Palo Alto, 5-year-old Anna Perone didn't seem to mind being cooped up in a dark room as the test subject of a Stanford University study. She was wearing a special kind of headset that fit almost comically over her white-blonde hair. Anna Perone puts on Oculus to play with Grover in VR. CBS News. "Okay Anna, do you see Grover?" asked Jakki Bailey, a Ph.D candidate running this particular study. "Can you wave to Grover?" Grover's image was projected on the wall opposite Bailey and her thigh-high test subject. When he waved back to her, Perone's whole body jolted. Through her goggles, she was actually in the presence of Grover, experiencing virtual reality. Stanford University's Virtual Human Interaction Lab has been creating and studying virtual reality, or VR, for more than a decade. "One of the things we study is the psychological presence," said Jeremy Bailenson, the director of the lab. "People are often stunned, it [VR] is really intense for them." Bailenson says that if VR systems become more commonplace in people's homes, which is expected as prices drop, children will find a way to wear them, so understanding the implications of that is now a priority for him. The study that Anna participated in was the result of a recent partnership between the lab and Sesame Street. "This could translate to how they [children] play and treat kids in real world experiences," said Bailey. 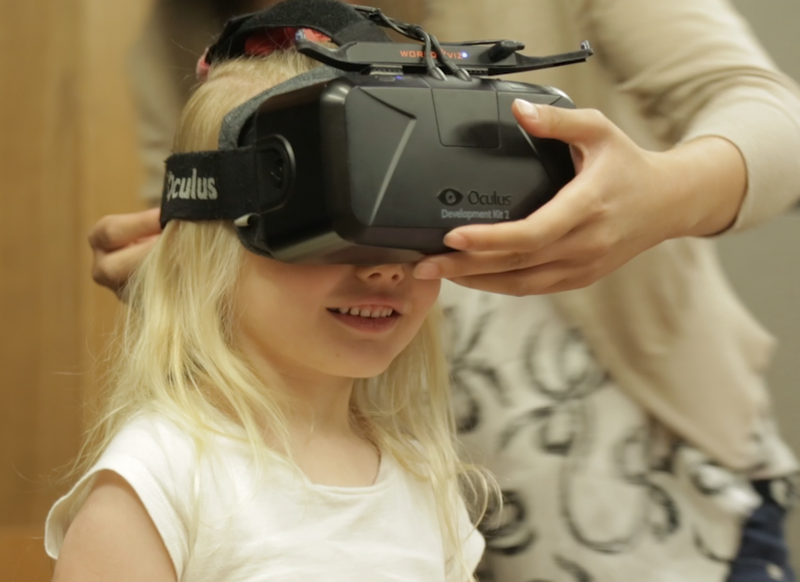 In 2009, the lab published the results of a study that focused on children's memory and VR. A group of kids were immersed in an underwater ecosystem, "playing with whales," through VR, and when they were asked about the experience a week later, about half of them said they remembered it as if it actually happened in the physical world. Bailenson explained how those results pointed to a need for a study like the one they just launched with Sesame Street, to provide more data about what the implications, and the dangers, of VR could be for kids. "What we're doing with Sesame Street- we're just exploring what type of [VR] content could be engaging for kids. More importantly, we're trying to see what's going to happen to a 5-year-old in general when she puts on the helmet," said Bailenson, referring to the Oculus head mount. "Nobody knows, in general we don't know what happens when a kid puts on a helmet." He added how they're taking this new study very "slowly" in order to carefully establish the environment of VR for kids.